The original Ruger Blackhawk single-action .44 six-shot revolver was introduced in 1956. (A single-action revolver requires the hammer to be cocked for firing, and half-cocked for loading or unloading). Such a revolver required an empty chamber under the hammer to prevent accidental firing from impact such as the gun being dropped or struck sharply. 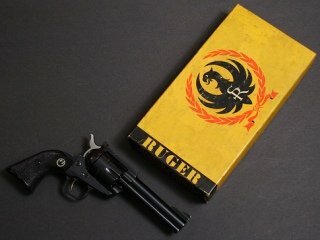 In 1973 Ruger introduced the New Model Blackhawk, which did not require the hammer to be half-cocked. A new transfer-bar mechanism prevented the cartridge under the hammer from being fired on impact, though an empty chamber is still recommended for greatest safety. A later variant, the Super Blackhawk, had a heavier steel frame machined for a scope. "The 50th Anniversary New Model Super Blackhawk commemorates this legendary revolver with special ornamentation and finish," said Ruger in a media release dated Jan. 15, 2009. This special 50th commemorative New Model Super Blackhawk was produced in limited quantities during 2009, which was coincidentally the 60th anniversary of Sturm, Ruger & Co. itself. "The 50th Anniversary New Model Super Blackhawk has benefited from 50 years of continuous refinements, including a unique reverse-indexing pawl for easy loading and unloading and Ruger’s patented transfer bar and loading gate mechanisms that give an unprecedented measure of security and convenience," claims the release. This is nothing new, but was a feature of the original New Model Blackhawk.